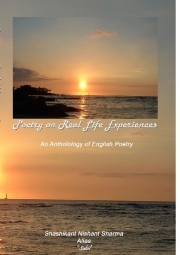 Description of "Poetry on Real Life Experiences"
This is a collection of contemporary poems in English by an Indian writer and poet Shashikant Nishant Sharma. This is the first published book of the author, poet, urban planner, consultant, social activist. This book contains poems which expresses the experiences of the poet during his young age ranging from village life to urban life of Delhi. You will find poems with beautifully carved rhythm and rhyme. The expression of emotions is made in a lucid manner to capture your imagination. Reviews of "Poetry on Real Life Experiences"
Nice remembrance of the college and school life beautifully portrayed in the poetic form. Inspirational poems by the poet is notewothy. The use of rhyme and rhythm in expressing his feelings, poet has done a wonderful job.